Eggplant Rollatini Fill 1 Created with Sketch. Rollatini, the Italian-style roll-ups of eggplant filled with ricotta, are an Italian-American interpretation of "involtini di melanzane." 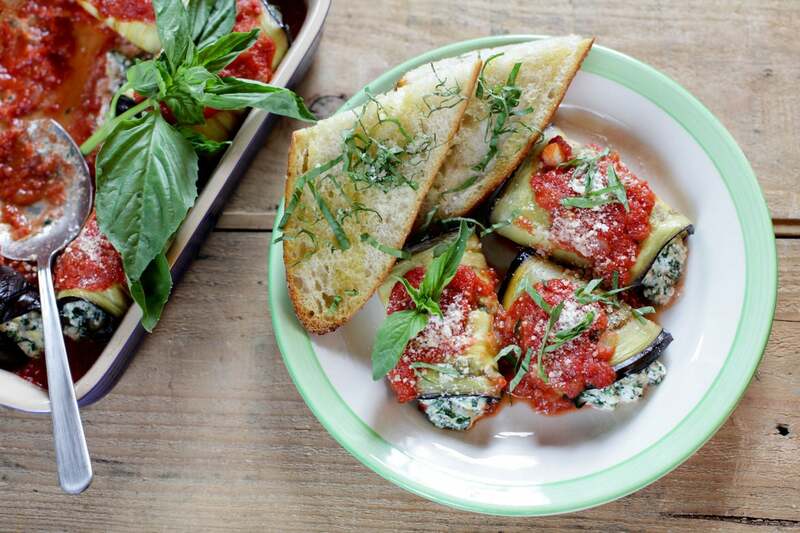 The word rollatini isn’t a real Italian word, but here in the U.S., it’s the one that commonly refers to this dish of vegetables wrapped around a filling. In this recipe, the cheese inside is flavored with lemon juice and zest, and flecked with chopped kale. Preheat the oven to 400°F. Lightly oil a large baking sheet. 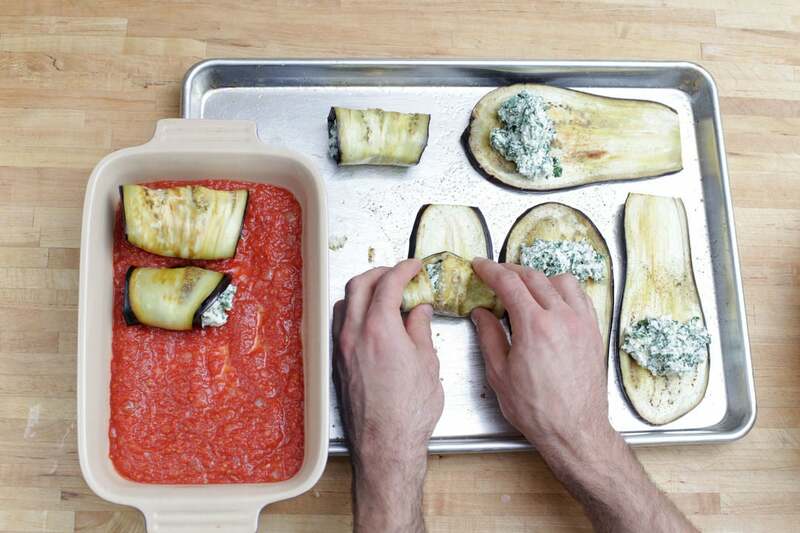 Trim the stem off the eggplant and slice it into ¼-inch thick planks. Place it on the oiled baking sheet, drizzle it with a little olive oil, and season with salt and pepper. 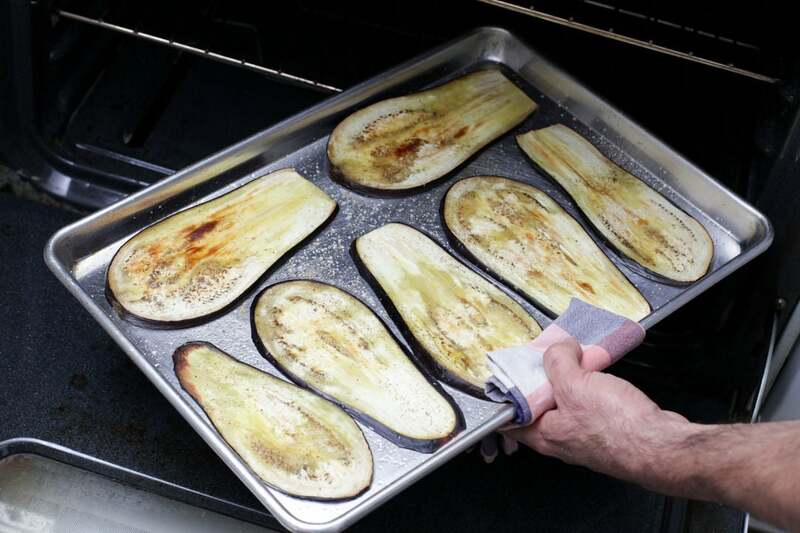 Bake the eggplant 17 to 19 minutes, or until lightly browned and pliable. Wash and dry the fresh produce. Remove the thick kale stems and finely chop the leaves. Peel all 3 cloves of garlic. Roughly chop 1 clove, finely mince one clove, smashing it into a paste, and leave the 3rd clove whole. Pick off the basil leaves. Slice baguette in half lengthwise. Use a vegetable peeler or paring knife to remove the lemon peel. Finely chop the peel to make zest (or use a citrus grater). Peel and small dice the onion. In a medium pot, heat a little olive oil on high until hot. Add the kale, season with salt and pepper, and cook 1 to 3 minutes, or until completely wilted and any moisture has evaporated. Transfer the kale to a medium bowl. 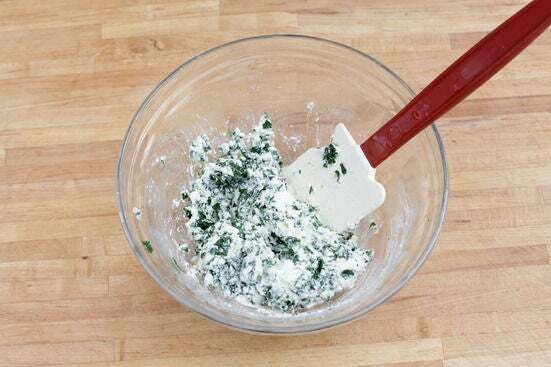 Add 1 cup of the ricotta, the garlic paste, lemon zest, one squeeze of lemon juice, and half the Parmesan cheese. Season with salt and pepper. Stir until combined. Wipe out the pot used for the kale. In the pot, heat a little olive oil on medium-high until hot. Add the onion and chopped garlic and cook 2 to 4 minutes, or until softened, stirring occasionally. Stir in the canned tomatoes and bring the mixture to a simmer. Season with salt and pepper. 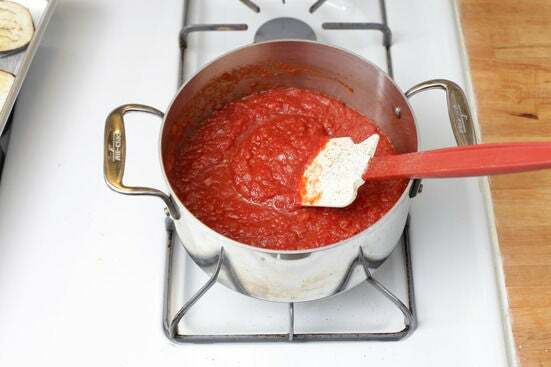 Simmer the sauce 3 to 5 minutes, or until slightly thickened. 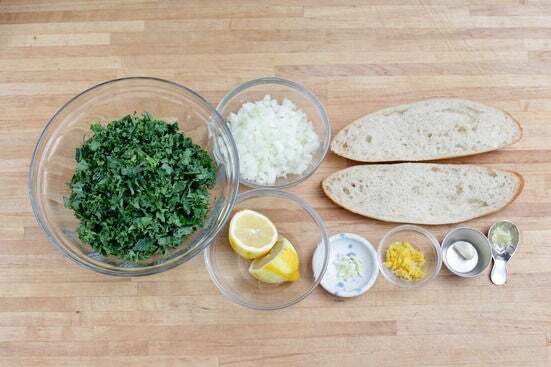 Rub the peeled garlic clove on the cut-sides of the bread while it’s still warm. Thinly slice the basil and use it to garnish the rollatini and garlic bread. 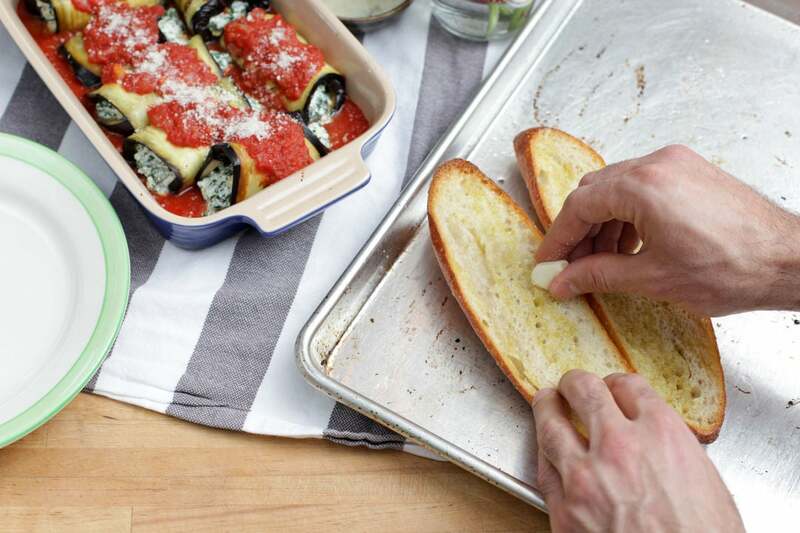 Divide the rollatini and garlic bread between plates. 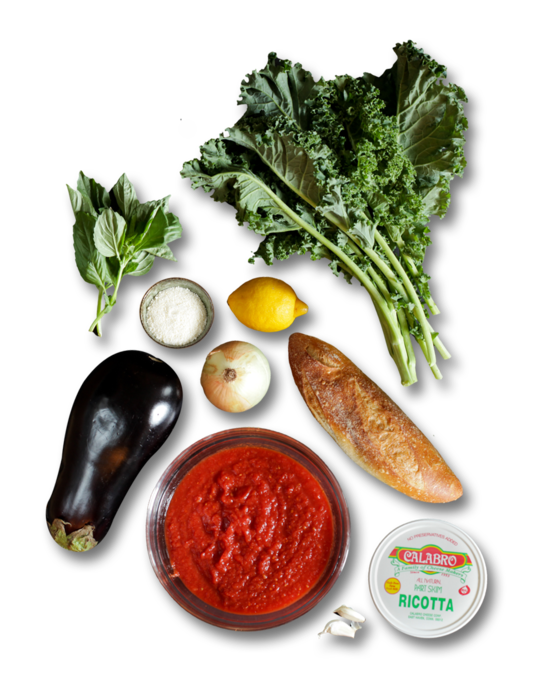 Garnish the rollatini with the remaining Parmesan cheese. Enjoy!